And you were impressed by the goat and the lamb, weren't you? I can't even... I don't know... My parental pride has me at a loss for words (don't worry, it's short-lived). 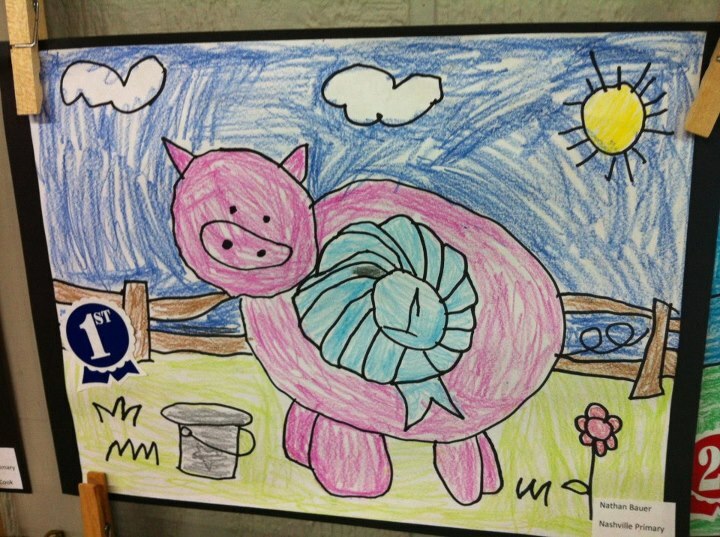 Last week Nathan's art teacher sent home a note saying a piece of his artwork was chosen for entry at the county fair. We were thrilled! 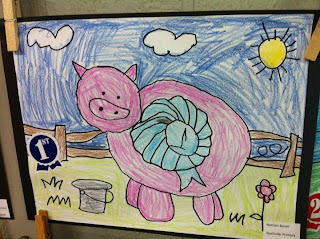 Little did we know upon entering the education building at the fair we would see this phenomenal first-place pig drawing. With my kid's name on it. I'm extremely impressed by this. Not only is my kid an independent kindergartner, he was able to do something on his own and win an award for it. Jonathan and I created a tiny baby that was capable of doing this by himself. Again bear with me on the parenthood stuff, but come on. This is awesome. Look at the pig, and the fence, and the little bucket. Goodness, this is cute! As I told you yesterday, Nathan did get to ride on the big yellow school bus to the Howard County Fair this morning. Here's the story he told me: He got to ride on the bus with his best buds Tucker and Manning (they're so tiny it's three to a seat - I can't stand it!). He said it was extra bumpy and lots of fun. There was a woman who talked to them about the animals and the rooster was his favorite. Reason being it was noisy and had "creepy yellow eyes." They also learned how bees make honey and were given a sample to take home. After that, they walked through the art building and his first-place pig caught his eye. "You know mom, I'm still really proud of myself." Me, too, buddy. Me, too. Oh, the wonders of the county fair! The award-winning artist and I wish you a happy Friday!